Bio: Chemical Burn is a band of heavy drinking, hard-hitting rock n’ roll beasts inspired by 60s psychedelia, 80s thrash, Delta blues, punk rock and Jack Daniels. 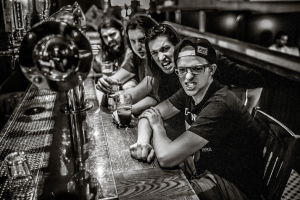 Formed in 2013 and comprised of four members, Chemical Burn brings elements of thrash, stoner rock, grunge and the blues into a group that isn’t afraid to brandish its unique weaponry. Stand up, raise your glass and join us as our love of partying is re-created for you!